n extensive and well-preserved rock art site that rivals the best rock art sites of the other islands. In a nutshell: An extensive and well-preserved rock art site that rivals the best rock art sites of the other islands. 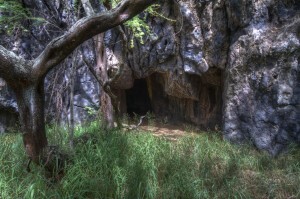 Minuses: This a remote place on Maui that requires some off-trail hiking in dense forest. The amount of kiawe trees in the area virtually assures that you’ll draw blood at some point. The discovery was made by a reader without completely accurate GPS or map information. 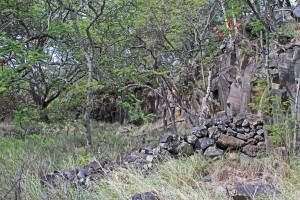 Ruins are plentiful in this area, but if you are going for the petroglyphs, in the article’s current state it will not lead you directly to them, you will have to search. As we are able to make multiple trips out to this location the map will be updated with more accurate information. Some guidebooks had touched on these existing in the area, but none had been able to find the exact location until recently. Ed Fornataro who writes a great Big Island resource called BigIslandHikes.com discovered the location, and has written the article below. I have made some edits with some factual information and will more thoroughly update the article soon after I get a chance to visit it myself. Good job Ed – and thanks for sharing with MauiGuidbeook.com! The rock art and ancient village sites are located near the lava flows of Pu’u Maneoneo near Waiu Bay. We found an amazing and extensive site with petroglyphs all over the lava rock walls. The rock art appeared to be the back walls of rooms partitioned with lava rock walls and perhaps roofed at one point. I had some information that there might be a heiau near the rock art, but there are so many old rock walls in the area that any of them could have been a temple at some point. At any rate, the overall site must have been an extensive ancient settlement, with a freshwater spring so close to the sea. This is a sensitive ancient site that very few visit. Many sites such as these exist, and have been preserved because there is no tourist traffic – please be very aware of the responsibility that this fact puts upon you should you choose to visit. This is located on property owned by Kaupo Ranch. Visitors should contact the ranch (808-248-8242) to obtain permission before visiting the site. Never take tracings or touch rock art or ancient sites. Don’t walk on rock walls or remove or add rocks to them. Take only photographs and memories, leave only (carefully placed) footprints. This area is extremely overgrown with poor footing in tall grasses and fallen tree branches with unseen lava features. I’d recommend long pants and sturdy boots to explore the area. It’s very humid and windless in the forests, so bring plenty of water. Many of the trees in this wind-battered area seem like they are about to break off at any time. Watch your head! If you don’t know what Kiawe trees are (and their thorns), you’ll be an expert after this hike. 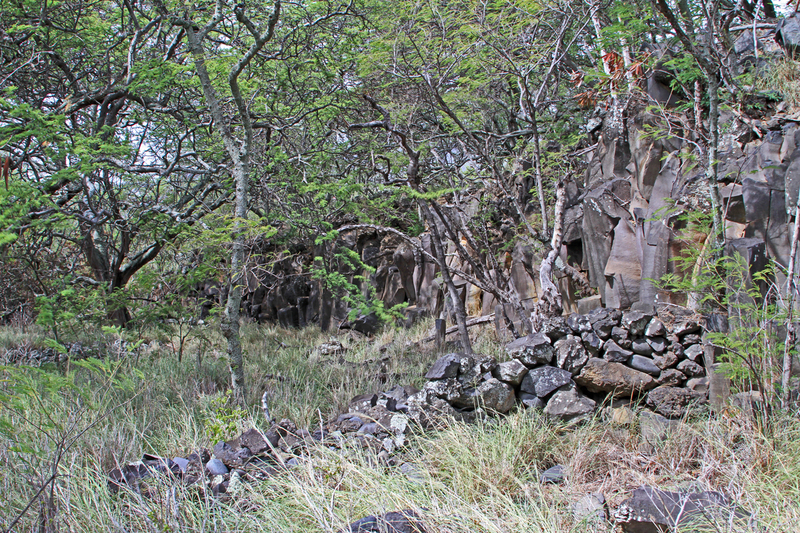 If you want to do the longer hike described below and view the ruins of this ancient village, park at Nu’u Bay public parking near to mile marker 31. To access only the rock art, go to approximately MM 31.75 and find a locked metal gate near a rock wall with parking just off the road for one or two cars. You’ll find the first rock art less than twenty feet from the gate. This is the route we took to find the site, which took several hours of hiking and searching the area. The only information I had to find this rock art was that it was located between the road and the ocean somewhere around Nu’u Bay or possibly mile marker 31 on Hwy. 31. 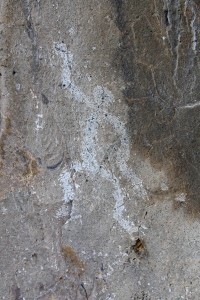 I also heard that the rock art was on a short fifteen foot lava wall. The author of the “Revealed” guidebook series thought that it might have been behind Huakini Bay, west of Nu’u Bay. Huakini Bay is a good guess because it does have some smooth lava rock walls that would have been perfect for rock art. After seeing Huakini Bay, I figured that any rock art there would be exposed and obvious, so I threw out that bit of info immediately and assumed that the art was further east. I drove past mile marker 31 near Nu’u Bay and then proceeded slowly toward mile marker 32, looking for a parking area or old road that might prove beneficial to the search or at least provide public access. I found a metal gate with a shiny, new lock closer to mile marker 32 that was clearly locked but not clearly marked as private property. The newness of the gate and lock made me leery of trespassing although it wasn’t posted as private property, so we turned around and headed to what I knew was public access to Nu’u Bay and parked there. To avoid any possible trespassing, we decided to walk down to Nu’u Bay from the road and then skirt the coastline on public beaches to try to look for the site. We found the remains of a structure that may have been a heiau for fishing near the point where the coast turns south and becomes small Nonou Bay. We then found numerous rock walls in the overgrown forests just off the rough shore. We began to follow these walls and found a low lava dike cliff that looked promising but produced nothing. We crossed a ditch and climbed over the lava dike and found a barely discernible old road. After crossing the old road, we noticed another low lava dike cliff in an area overgrown with koa and kiawe. We found a short lava tube cave that was likely used as a shelter in this overgrown area and lots of nice lava that would be great for rock art, but still nothing. Following the old road outside the overgrown area led us to Waiu Bay. At this point we were running short of water and getting frustrated, and we decided to give it one more shot back in the overgrown forests just off the coast. We left Waiu Bay and hiked north and found another extensive area of rock walls with an overgrown depression that I identified as Waiu Spring on my map. We hiked east through more thick forest and found another lava dike cliff that was about fifteen feet high. 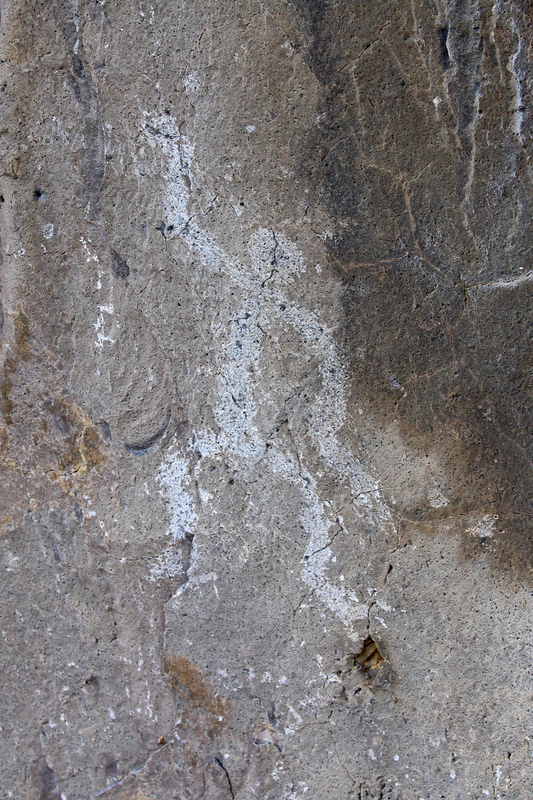 We found an amazing and extensive site with both petroglyphs and pictographs all over the lava rock walls. 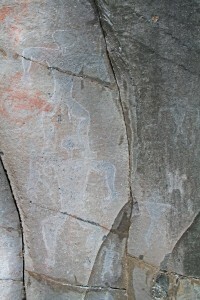 The pictographs included colors of white, blue, and red. (We later learned that some of the colored painted pictographs may have been added more recently.) The rock art appeared to be the back walls of rooms partitioned with lava rock walls and perhaps roofed at one point. I had some information that there might be a heiau near the rock art, but there are so many old rock walls in the area that any of them could have been a temple at some point. At any rate, the overall site must have been an extensive ancient settlement, with a freshwater spring so close to the sea. Most out of place here, there’s an old, rusted truck broken down just outside the site. We hopped the fence and walked back to our car at Nu’u Bay. If you got this far, you will appreciate that the star rating on this article has been intentionally lowered to reduce over-exposure of this unprotected sensitive cultural site. Please be certain to respect this if you choose to visit. Ed at Big Island Hikes (www.bigislandhikes.com). My unnatural obsession with the Big Island of Hawai’i led me to recently launch a website to hiking and exploring it called Big Island Hikes. I just took my first trip to Maui this Fall and used this site extensively to plan a great trip. When I found this amazing place, I was grateful to be able to give back to this website by writing this guest article. It’s extremely unfortunate that sacred sites are being posted for anyone to see…this is exactly how so many have been desecrated or destroyed. It happens over and over from “revealed” websites and books. It’s not if, but when. If you know someone here that will take you somewhere special, fine….anything else is cultural incompetence. Hi: I took a quick look on a Hana Highway loop one day, and then spent the better part of an afternoon looking for these. Firstly, I can tell yo there is nothing at 31.75M that evenly remotely resembles what is described here. That point on the road is close to an old spring irrigation tank on a grassy highland, and there are no fences or steel gates. for several hundred metres from the road. nearby in either direction. I checked out many steel gates from the 30-33 mile markers where it seemed likely that there was a volcanic dyke nearby, and did find lots of old dryland farming fences and a couple of structure mounds that are obviously pre-contact, but did not find the petroglyphs. There is something off about the mile markers or description of the site. I’m not sure of the mile marker, but I can testify to the reality that the site DOES indeed exist! I just had the most memorable experience of all my times on Maui as I was escourted there by a dear friend who lives in Kula. I will treasure the time I spent there. It indeed is very near the road! I’m currently visiting maui and I’m really interested in visiting this site. I’m an archaeologist from the Four Corners area and strongly believe in preservation and leave no trace and can assure a high level of respect for this site. Seems fairly strait forward when reading the article and looking at the map. Anything new I should know or any info at all would be helpful. Thanks for your time. Everything we know is in the article, lease let us know what you find – and good luck! Fantastic piece. I especially appreciate the emphasis on “leave no trace.” Do not touch, do not disturb – this area is like a museum of Hawaiian history. I’m a petroglyph explorer from Southern California. I’ll be on Maui soon and I’d like to take a shot at finding this site. Do you have any updated location info or any other intel that might be useful? Thanks for a great article. Have a great visit to Maui!